Deal along with any other town or village in the land used coal as a fuel. We find references to it in some quite unlikely quarters, like a book of sketches and in the Orders of the Town Council. During the 16th century reserves of wood were becoming depleted generally and coal was more important as a fuel. Important areas for coal production were Northumberland and Durham because the coal was very easy to get at. The coal was transported down the coast by boat to London, the major user of coal, and there, transhipped onto local “coasters” and brought to our shores. To unload was hazardous as the coaster had to be beached first. High tonnage was possible before the steam age because of horse drawn wagons on wagonways at the coal field end, the earliest known example being 1604 in Nottinghamshire1. At Deal, basic man power would have been needed to get the load up the gravel beach. A case of ‘all hands on deck’ when the coaster came. We know that coal has played a major part in this town because of written documentation. In 1712 a tax authorised by Parliament was levied locally on coal brought ashore to pay for the building of St George’s Church at the rate of 2s per chaldron2. A tax of this nature was common practise at this time. This tax continued for 15 years and raised £2,129 (£170,320 in today’s money) On average Deal and the surrounding area was using 1,420 chaldrons of coal a year corresponding to about 2000 tons per annum being carried ashore! The coasters of the time carried about 50 tons per load so about forty ships per annum. The 2000 tons was just for Deal. The coal yard shown on the 1871 map is in Walmer. Coal landed here was exempt from the Deal Coal Tax and Orders levied by Deal Borough Council, but it would have been distributed to the surrounding area. There are resolutions passed by Deal Council in the Assembly Minutes books relating to the trade in coal. It became a closed shop and only freemen of the town could join one of three gangs to move the coal. There is a printed notice to this effect from 18163 listing the orders and the names of all the workers employed in the thre gangs. The coming of the railway to Deal in 1847 would not have ended the coastal trade because of the economics. A bulky heavy commodity is always going to be cheaper to shift by boat than rail. 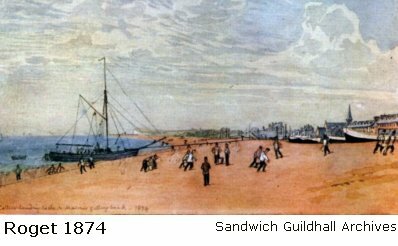 The ’Coal Yard’ shown on the 1871 OS map on the beach south of Deal Castle belongs to Mr Ralph. The pictures show his yard and the boat being beached and unloaded. Further, there is a description of Mr Ralph's business in 1896, showing it continuing by his executors after his death4. 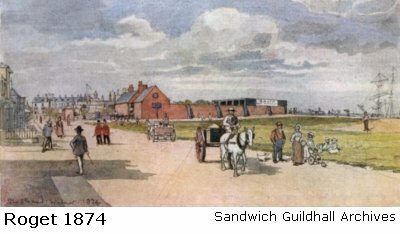 This entry also shows an engraving of a coaster, but the firm also had a depot at Deal railway station. The Register of British Shipping for Deal records that Harrison Ralph co-owned two vessels with Thomas Bushell, the North Deal miller. The timeline shows the Ralph family and their exploits and previous mentions of people dealing in coal. The trade directories list these people. 1874 Roget Sketches Coal Yard shown in watercolour. 1840 Pigot Harrison Ralph Corn & Flour Merchant. Coal Merchant. Also Ralph & Bushell hoys to London every Friday. 1798 William Ralph Corn Chandler. Witness in a large trial involving Treason. 1794 M William Ralph M. Hannah Lampole 3 ch Sarah 1795, Harrison 1797, Hannah 1800. Further information may be available in U3/67/28/30 in Canterbury Cathedral Archives but it went missing in 2009. It is a Chapel Book of St George's Church, Deal 1712 - 1726. It contains amongst other entries ….. copy of the Act for completing the Chapel by levying a duty on water bourne coats (sic) 1712 ….. account of money collected from the duty on sea coals …… accounts of coals landed at Deal 1716-1725 giving the name of ship, Master and quantity in chaldrons and bushels. If this record comes to light please contact the author! There may be this information in a different record book at EKA ref QC/1 covering the peroiod 1707 - 1725. Research on this topic was sparked off because of the 1871 OS map showing a Coal yard marked as such on the beach south of Deal Castle. It soon became quite clear that boats were involved and the trade was quite intense and had been for centuries. Regulation by Deal Town Council was unexpected and brought forward several more avenues of research. Many people are mentionned in this trade.